Earlier this year, Amazon announced that it would bringing back the cult classic superhero comedy The Tick, but without original star Patrick Warburton. Instead, Peter Serafinowicz will be playing the big blue bug, and now Amazon has released the first images of Serafinowicz in costume—along with a shot of Whoopi Goldberg interviewing a different superhero for some reason. The images come from ComicBook.com, which also quotes an Amazon press release as saying that the show is about “an underdog accountant with zero powers” who discovers that his city is being controlled by “a global supervillain long-though dead.” While trying to expose this evil plot, he crosses paths with none other than Serafinowicz’s Tick. As you can see in the picture below, the new Tick costume has a bit of an H.R. Giger-y techno-organic thing going on, which makes it a little off-putting, but that could easily just be part of the joke. If this Tick show is anything like the old one (or the cartoon or the Tick comics that predate all of them), then things being kind of weird is definitely to be expected. 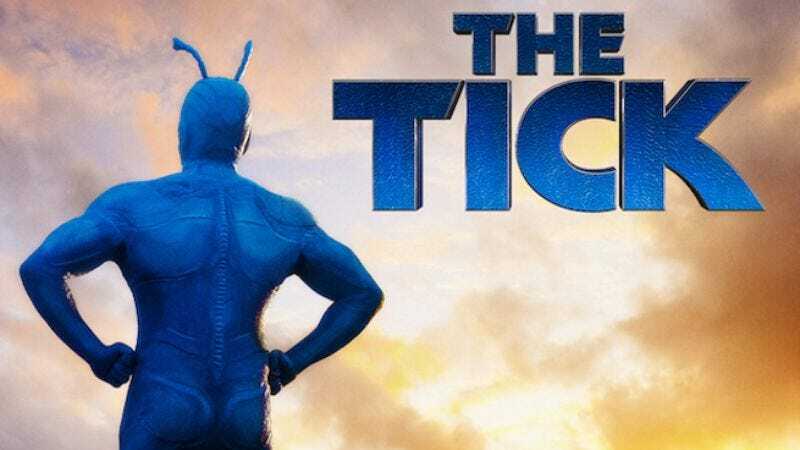 Amazon also confirmed that The Tick will debut on August 19 as part of its pilot season.